Why Gabby Douglas has been the target of so much unfair, petty criticism at the 2016 Olympics. Gymnast Gabby Douglas sits on the beam during the qualifying for the women’s beam event at the Olympic Arena during the Olympic Games in Rio de Janeiro on Aug. 7, 2016. 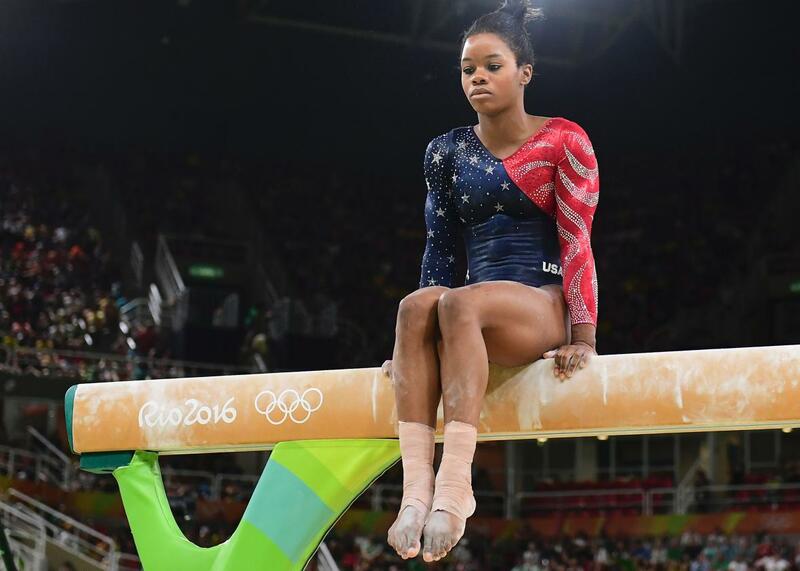 Gabby Douglas is the saddest gold medalist in Rio de Janeiro. At first, it seems difficult to understand why. The 2012 all-around winner arrived at the Rio Games not as an individual favorite (it is, after all, the Year of Biles), but was an integral part of the indomitable, world-destroying, medal-hoovering Team USA. In addition to winning gold in the team competition, she exceeded expectations in the qualifying meet, finishing third, beaten only by her teammates Simone Biles and Aly Raisman. Douglas should’ve advanced to the all-around finals, but was kept out thanks to an infuriating rule that limits the event to two athletes per country. Her games, though, won’t live on as a reproach of that dastardly rule. Nor will Douglas’ time in Rio enter posterity as a testament to her retention of the vast majority of her abilities for four entire years, aka an eternity in elite gymnastics. Alas, for the returning Olympian and sometime reality star, these games have been marred by attacks on her patriotism and appearance and attitude, and basically everything she’s said and done for the past few weeks. It’s worth asking, as Douglas leaves the Olympic stage for probably the final time, why one of the greatest champions in the history of gymnastics has become such a frequent target of dumb criticism. The first Gabby-related controversy in Rio came when she failed to place her hand over her heart on the gold-medal podium with her teammates. One early critique, a stunning display of superfluous concern-trolling by the Los Angeles Times’ Bill Plaschke, chided the gymnast for her alleged Un-American Activity. “By all means,” he wrote, “do not use the podium to pout, and it seemed like Gabby Douglas was simply pouting.” Douglas, for her part, apologized. Next, Douglas was criticized for her supposed failure to cheer for her American teammates while watching from the stands. Screengrabs were taken and widely disseminated. A hashtag, #CrabbyGabby, was born. Even the most patriotic and smile-dependent among us could see the ire directed at Douglas was outsized. She wasn’t the first Olympian to “disrespect” our national hymn in Rio; that’d be Orioles fan Michael Phelps, responding to a spectator’s (also technically “disrespectful”) shout of “O!” She wasn’t the first Olympic gymnast to “disrespect” the medal stand either; you’ll recall the eternal pout of meme hero McKayla Maroney. So why is everybody picking on Gabby? The answer is complicated, and dates back at least to her Olympic debut in 2012—you know, when she won the all-around, and still managed to “start” a media firestorm for the unforgiveable crime of yanking her hair back into the the purposefully sloppy coif every single one of her teammates was sporting without incident. It’s almost as if there was something about Gabby that made her more prone to irrelevant criticism. What could it be? Could it be that as a talented young, black, female athlete, Douglas was subjected to gendered, racialized scrutiny that created impossible expectations for her comportment? (It’s also worth mentioning that some of the criticism of Douglas’s hair came from within the black community.) This year, the leftover kindling from 2012, stoked by more instances of Douglas’ “failure” to live up to some ridiculous standard of behavior—prancing around with hand glued to heart at all times, sycophantic grin unmoving, I guess—became a full-blown conflagration. Of course, Simone Biles is also talented, young, female, and black—why has she thus far avoided similar scrutiny? To call the current coverage of the four-time gold medalist “hagiographic” would be an understatement. The easy answer, of course, is that Biles is winning by huge margins almost all of the time, so she has yet to give us much of an opportunity to see what she looks like when she’s disappointed. The one time she failed to win gold, earning a bronze medal on the beam, she managed to brush off comments about how “only” winning four golds in one games was somehow a disappointment. This is likely due to Biles’ famously bubbly temperament, which makes Douglas’ more solemn nature look even more dire by comparison. Especially when viewed alongside the do-no-wrong Biles, Douglas—who is in a completely different place in her career—gets more scrutiny, no matter what she does. Yes, sure, she was probably sad on that medal stand, because she knew it would be her last time there. You would be, too, if you couldn’t contend for an all-around medal because of some dumb rule you didn’t make. Jordyn Wieber certainly wasn’t happy about being similarly excluded in 2012, and Aly Raisman was “definitely really sad” when she lost out on a bronze medal in London due to a silly tiebreaker. These are all natural responses to difficult situations. Douglas surely has been the target of more criticism because she gets extra scrutiny as a black female athlete. But it’s also true that everybody is picking on Douglas because she commits the grievous sin of being slightly emotionally withdrawn and profoundly sensitive. Douglas—who went professional after London, gave up her NCAA eligibility, and supports her entire family, which she pulled out of poverty—was spotted crying quietly alone in a corner of the Rio Olympic Arena after the uneven bars final on Sunday night, when she finished a disappointing seventh in her final event of the games. Why was she so sad? Because after the meet, instead of discussing her gymnastics with reporters, she had to field question after question about the ridiculous criticism she was getting on social media. Whether this was a torrent of criticism or a few jerky randos, it obviously felt like a deluge to Douglas. And anyone who has been on the business end of a Twitter mob knows exactly how painful that can be. This was a classic Internet Misery Spiral: Douglas heard the criticism of her alleged bad mood, and that made her miserable. Cameras alighted on her misery, and that caused more criticism, which in turn made her even more miserable. The internet, as it is wont to do, got a whiff of sensitive-person blood, and fed in an according frenzy. It doesn’t help matters that Douglas prefers the company of her family to her teammates. This may have to do with years of trauma from the bullying she incurred in her early training days. It may simply be that she’s particularly tight with her family. One of the most heartbreaking anecdotes I’ve ever read was the tale of her team’s first-place finish at the world championships in Tokyo when she was just 15. She called her mother—who couldn’t afford to travel to Japan—in tears. “She was sobbing so much. I heard her say that she was all alone and had no one to celebrate with,” her mother, Natalie Hawkins, told the Washington Post. God forbid we allow the Final Five to have a range of human personalities, and just leave them to their business—which is, I remind you, not flag worship, or convincingly impersonating a drunk 45-year-old mom at a Bon Jovi reunion concert. It is gymnastics. I, for one, will remember Gabby Douglas for her tumbling on the mat and her majestic swings on the bars, not for how widely she grinned or where she placed her hand during the national anthem.